On World No Tobacco Day, marked on 31 May 2017, WHO called on countries to prioritize and accelerate tobacco control efforts as part of their responses to the 2030 Agenda for Sustainable Development. Under the slogan “Tobacco threatens us all”, countries across the WHO European Region planned and took part in activities highlighting the social and economic costs of tobacco use. They emphasized that all countries can benefit from implementing strong tobacco control measures in line with the WHO Framework Convention on Tobacco Control (FCTC). Many countries took the opportunity of World No Tobacco Day to plan media events and press conferences in cooperation with national authorities and political figures, including ministers of health and parliamentarians. These events, some of which took place in Albania, Armenia, Azerbaijan, Kyrgyzstan, the Republic of Moldova, the Russian Federation and Tajikistan, led to significant national media coverage across print, television and online media outlets. A number of countries focused their efforts on existing tobacco control legislation or legislative efforts underway to strengthen tobacco control. 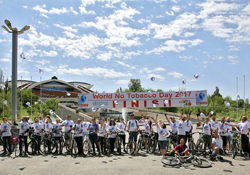 Czechia, Georgia, the Republic of Moldova, Slovenia and Ukraine, in particular, emphasized the role and importance of national legislation to control and reduce tobacco use. In Czechia, the Law on the Protection of Health Against the Harmful Effects of Addictive Substances entered into force on 31 May 2017. Other countries, such as Kyrgyzstan, Serbia, Slovenia and Uzbekistan, planned tobacco control-related meetings and round-table discussions with experts. Many of these meetings were intersectoral in nature and focused specifically on tobacco control as integral to achieving many of the Sustainable Development Goals. Activities designed to raise awareness among the general public about the dangers of tobacco use and the importance of tobacco control measures took place across the Region. These ranged from a “Say NO to Tobacco” cycling tour and text message campaign in Armenia to a 3-day “Apple instead of a cigarette” action in Azerbaijan. Additional activities included a youth-driven petition campaign in Bosnia and Herzegovina to strengthen tobacco control measures; a “Last stub-out” campaign in Czechia; video and essay competitions in Kyrgyzstan; and a mass media campaign in Uzbekistan. Ukraine launched smoking cessation services and Kyrgyzstan provided free consultations to support those wishing to quit. World No Tobacco Day events also took place in Brussels, Belgium. These included a high-level policy debate with Dr Vytenis Andriukaitis, Commissioner for Health and Food Safety at the European Commission, and Ms Kristina Mauer-Stender, Programme Manager for Tobacco Control at WHO/Europe. To support countries with their World No Tobacco Day outreach and activities, WHO/Europe produced a set of factsheets for south-eastern European countries and newly independent states. The factsheets outline projections based on the SimSmoke tobacco control model. They show the reductions in smoking prevalence and smoking-attributable deaths that can be achieved by fully implementing tobacco control policies over both the long and short term. WHO/Europe also published a paper on the links between tobacco control and the Sustainable Development Goals for World No Tobacco Day, along with several stories profiling tobacco control efforts in specific countries of the Region. Each year, WHO also recognizes individuals or organizations for their accomplishments in the area of tobacco control. The European Region’s 2017 World No Tobacco Day award winners included: Czechia’s Deputy Minister of Health Dr Lenka Teska Arnoštová; Germany’s Unfairtobacco project; Ireland’s Department of Health; Kazakhstan’s National Centre for Problems of Healthy Lifestyle Development; Serbia’s Head of the National Committee for Tobacco Prevention Dr Srmena Krstev; and Slovenia’s Minister of Health Ms Milojka Kolar Celarc.